Auf die inneren Werte kommt es an: Edles Kessel-Design, von Hand gehämmert trifft modernste drum-tec Triggertechnologie, flüsterleise und supersensibel. Quality far exceeds the price! 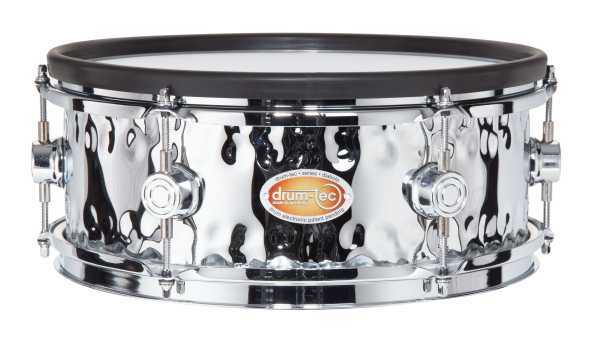 The Drum-Tec Diabolo hand hammered snare is on a level I wasn’t expecting at this price. I was skeptical and thought maybe it was all flash and no substance. But the quality of the parts used throughout exceeded my expectations. Metal trigger bases. Flawless construction. The snare is just as beautiful inside as it is on the outside. This may be a mid priced snare but they didn’t skimp on anything. The playing feel is exceptional. And their is no hot spotting issues across the playing surface. I have a lot of nice edrum equipment. And it takes a lot to impress me. But somehow drum-tec manages to impress every time. Super Verarbeitung, geile Optik! Lässt sich mit dem "real feel"-Fell sehr gut spielen - sehr leise! Danke an das drum-tec-Team, immer freundlich und sehr hilfsbereit, egal ob per Telefon oder per Mail!!! Hallo zusammen, hab die 13" HH zu meinem diabolo Set geordert. Ehrlich gesagt hat diese Snare meine Erwartungen übertroffen. Super Verarbeitung, super sensibel was das triggern angeht und geile Optik!!!!!!! tolle Ansprache der Trigger (auch im Rim-Bereich). Dazu kommt noch: Sie sieht nicht nur toll aus, sie ist auch sehr gut verarbeitet. Volltreffer !!! Tolles Teil, besser als alles was ich je hatte, und da war so ziemlich alles dabei was Rang und Namen hat! Authentischer look und brillante Ansprache! Super gute Qualität und viel spiel Freude! Habe vor kurzem diese Trommel gekauft, weil ein Freund von mir, sie mir empfohlen hat. Ich habe angefangen, mir ein elektronisches Schlagzeug zu bauen, weil ich zuhause spielen wollte, aber nich auf Kompromiss mit der Qualität gehen wollte! Die Beratung ist Weltklasse, ob man eine Mail schickt oder anruft, immer freundlich und sehr hilfsbereit!!! Drum-tec diabolo 13" x 5" meshhead Snare Drum and Pearl Mimic is amazing! I just received my drum-tec diabolo 13" x 5" Hand Hammered mesh head Snare Drum yesterday. I am blown away at the feel, playability and triggering with this drum! I have been using my Roland TD30 for years now and just upgraded to the new Pearl Mimic drum module. The Mimic is simply incredible because of the superior samples within the module and the many articulations of samples. Playing on my Roland PD128S pad was good, however, to really hear the samples with all the articulations and velocity you need to use a superior triggering system and no doubt the Drum-tec drums do this better than any pad I have ever played. The Drum-tec diabolo 13" x 5" Snare Drum plays like a dream and feels very real and natural. Now, being so impressed I must save up and upgrade to the Drum-tec Pro Series kits which have even better triggering then the Diabolo series! I would highly recommend to any serious players do yourself a favor and get the Drum-tec pads. Blows the Roland pads away by leaps and bounds. J'ai branché ce modèle sur une TD25 de chez Roland et c'est bluffant. J'ai pris une peaux "real feel" sur cette caisse claire de 13" pour un touché quasi similaire à une vraie caisse claire. Il y a peu de différence avec un pad Roland en terme de nuisance sonore (le fut ne résonne pas beaucoup même sur les rimshot, ou alors faiblement et on ne l'entend pas). Le pad est parfaitement reconnu et Drum-Tec fournit les réglages à apporter sur le module pour que ça fonctionne parfaitement. Une caisse claire électronique proche de la perfection !